Young children love farm animals and here they have the opportunity to touch and interact with them! At HULL-O FARMS Family Farm Vacations, they will get hands-on experience of learning how to feed baby animals, milk cows and nanny goats, feed the pigs, and play with cuddly kittens on a real farm. Just imagine watching your family’s grandchildren or children do this for the very first time. Farmer Frank and his staff will give your children an educational experience that they will never forget! What’s the best way to get eggs from the chickens? How do you hold the bottle for baby goats that is different than how you hold it for lambs? What’s the best way to milk a cow? What signs do Catskills farmers look for when checking on rain at an upstate New York farm? 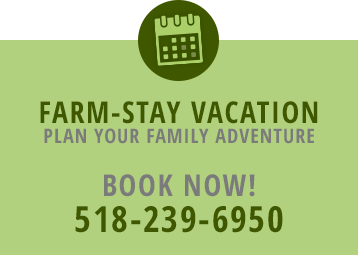 Parents, did you know that HULL-O FARMS Family Farm Vacations is part of the New York Agritourism & Education Program? Upstate New York farm families participating in this unique program invite you to learn more about our number one industry – Agriculture. A farm stay with us isn’t just a vacation – it’s an educational experience!